In conjunction with her Armas Desnudas art exhibition at Mighty Fine Arts, WordSpace presents Swirve and Rosemary Meza-DesPlas, kicking off the Swirve Presents Swirve Series at WordSpace. Rosemary Meza-DesPlas has always written poems or short stories in my sketchbooks. The poems and short stories seem to compliment the rough and scratchy sketches of half-formed visual ideas. In 1994 she published a poetry chapbook titled “The Laughter Between My Legs” and created drawings to go along with each poem in the book. 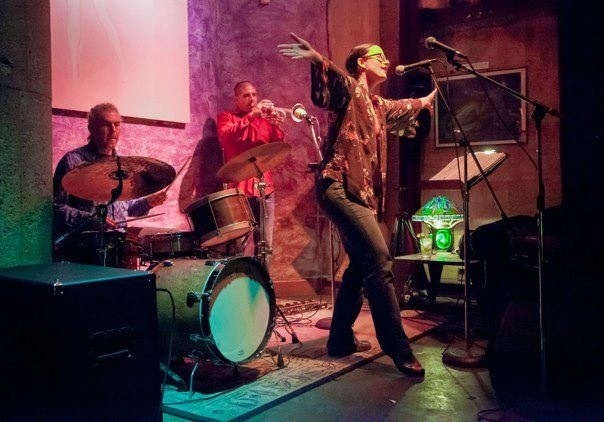 Swirve is a Dallas music, spoken word and experimental performance ensemble featuring Tamitha Curiel, Chris Curiel and Gerard Bendiks. The members have been known to play the trumpet backwards, the drums upside-down, and shout sideways. They have performed in galleries, nightclubs, festivals and bbqs. They have also collaborated with many of Dallas’s other fine artists, including Tammy Gomez, Mad Swirl. Alison Starr, Kenny Withrow, and members of Yells at Eels. The “Reveal” Reception @ Half Price Books, NW Highway. Join us for wine and a splasy promo reception as we reveal our full lineup and turn ticket sales on with Members Discounts. Wordspace is honored to have Half Price Books as principle artists sponsors for this benefit series that supports our 50+ annual programs. Additional partial sponsorship of our 2013-14 Season is made possible by the City of Dallas Office of Cultural Affairs, board, members and friends. WordSpace presents the first annual Donor Bridge Day “Word-Up” featuring the “Word-Up Allstars” on Thursday September 19 at the Kessler Theatre from 7-10 pm. This is a benefit event that will offer spoken word performances from famous and infamous poets, writers, and artists to help raise funds for WordSpace. Every dollar will be maximized and then some by Donor Bridge! The “Word-Up Allstars” lineup includes 10-minute performances by Matt Bagley, Michael Clay, The Dallas Poetry Slam Team, The Andy Don Emmons Revival, Randall Garrett, Joseph Justin, William Bryan Massey III, Rosemary Meza-DesPlas, Carlos Salas, Opalina Salas, Bruce Webb, Josh Weir and Laney Yarber. Special Suprise guests are imminent! This cabaret cavalcade is a unique extravaganza of talents and sensibilities that will help celebrate the power of WordSpace, which provides Readings, Salons, Next Generation Projects, lively Panel Discussions and Showcase Events featuring emerging to prominent writers, and performers all year long! Join us for “Word-Up” admission is FREE! But we hope that everyone will help realize our goal for the day of 100 folks giving up $35 each for a Wordspace membership donation. This is a once in a blue moon opportunity to catch a line-up of notoriously gifted folks who will cajole, enchant, entertain, enlighten, and amaze! MCs include WordSpacers Rock Baby, Alexandra Marie, Karen X, Dee Mitchell. Make plans to come out! Bring your cash, check, or credit card, have a favorite beverage, hang tight, hold on to your hat and your seat ‘cause this is going to be big fun!